Patient will present a → a 30-year-old obese white female presents with fatigue and generalized weakness for several weeks. Physical exam reveals pale nail beds, spoon nails, mucosal pallor and an atrophic tongue. Upon further questioning, the patient reveals a "craving for ice and inanimate objects." Laboratory data shows a microcytic, hypochromic appearance to the RBCs, an elevated TIBC, low serum iron of 16 µg/dl, and a low plasma ferritin of 12 µg/dl. What is the earliest finding in iron deficiency anemia? What is the latent finding in iron deficiency anemia? In men, the most frequent cause is chronic occult bleeding, usually from the GI tract. 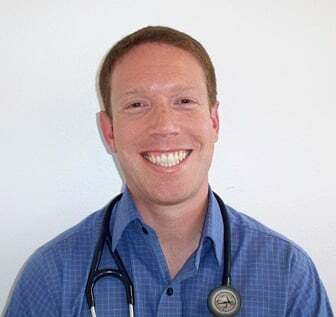 "Lead poisoning is a common question on the PANCE/PANRE look for Basophilic stippling and remember treatment is with EDTA." Other causes of ↓ MCV include lead poisoning (look for this in a patient with neurological symptoms), sideroblastic anemia, basophilic stippling, and thalassemia. Treatment is with EDTA. Iron deficiency anemia accounts for more than half of anemia cases worldwide. It is typically caused by malnutrition (decreased ingestion of meat, eggs, iron-fortified foods and leafy greens), as well as malabsorption (IBD, parasitism, celiac disease). Hemorrhage is another reason for this type of anemia, which may be caused by heavy menstruation, parasitism, malignancy or ulceration. This is a microcytic, hypochromic anemia which is caused by decreased heme synthesis. Labs typically show decreased reticulocytes, and decreased ferritin, which is an iron-storing protein. There is also an increased red cell distribution width, which helps distinguish iron deficiency anemia from thalassemia. Microcytic anemia is defined as an anemic state with a red blood cell MCV < 80 fL and is caused by a decrease in hemoglobin synthesis. 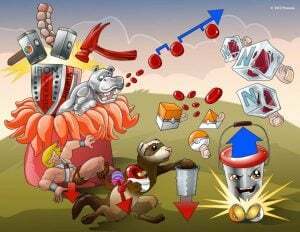 Hemoglobin is composed of both heme, which contains iron and protoporphyrin, and globin chains, so anything that affects the synthesis of these precursors can cause a microcytic anemia. 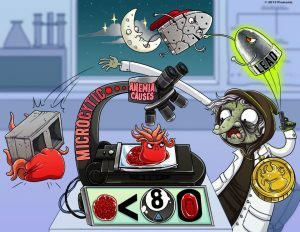 The most commonly tested causes of microcytic anemia include late-stage iron deficiency, anemia of chronic disease, thalassemias, lead poisoning, and sideroblastic anemia. A 35 year-old female presents with fatigue. CBC results reveal the following: WBC: 6,300/microliter Hgb: 9.5 g/dl Hct: 28% MCV: 75 fL MCHC: 32 g/dl MCH: 24 pg Platelets: 550,000/mL Which of the following is the best treatment option for this patient? Vitamin B12 and folate deficiency present with macrocytic cells and are treated with vitamin B12 and folate respectively. Prednisone is used to treat immune-mediated hemolytic anemias which present with normocytic, normochromic red blood cells. Iron deficiency anemia is a microcytic, hypochromic anemia and is treated with ferrous sulfate. A mean corpuscular volume (MCV) of less than 80 cubic microns is a manifestation of which of the following diagnoses? Vitamin B12 deficiency is associated with macrocytic anemia. Folate deficiency is associated with macrocytic anemia. G6PD deficiency is not associated with a low MCV. Iron deficiency is associated with microcytic anemia. A 46 year old man presented with symptoms of anemia. Hb and MCV done were 9g/dl and 72 FL respectively. Which of the following is not a likely cause of his anemia? Folate deficiency is a cause of megaloblastic anemia. The patient presented has microcytic anemia. The most important cause of iron deficiency anemia in adults is chronic blood loss, especially gastrointestinal blood loss. Celiac disease is an occult cause of iron deficiency through poor absorption in the gastrointestinal tract. Excessive vomiting cannot lead to iron deficiency but rather dehydration and electrolyte derangement. The result of a patient’s iron studies showed: reduced serum iron, reduced serum ferritin, absent iron in bone marrow. What is the patient’s most likely diagnosis? reduced serum iron, normal or raised serum ferritin, Iron present in bone marrow. raised serum iron, raised serum ferritin, Iron present in bone marrow. normal serum iron, normal serum ferritin, Iron present in bone marrow. Iron studies of a patient Iron deficiency anemia: reduced serum iron, reduced serum ferritin, absent Iron in bone marrow. Reticulocyte response to iron therapy is usually evident within a week. The other options, while reasonable, will have a slower response to therapy. Which of the following statements about iron deficiency anemia is incorrect? Can present as pica, koilonychia, cheilosis, and dysphagia. The reticulocyte count may be high. Is treated with ferrous sulfate. Can be caused by zinc deficiency. Reticulocyte count in iron deficiency anemia is usually low or inappropriately normal.